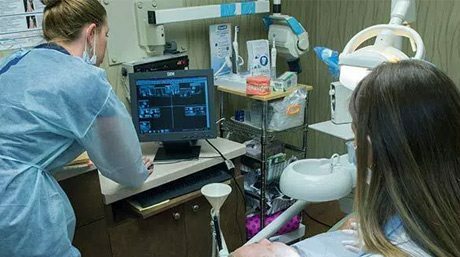 At Friedman Dental Group we use the latest All-On-4 technology to make all aspects of your dental implant procedure accurate and comfortable. We will issue you a free dental implant CT Scan as part of your dental examination with us. The CT Scan will help us to examine the status of your mouth and jaw, and will also give a clear picture for use in the diagnosis, planning, and preparation of the implants. A CT Scan is a highly advanced scanning device used in dental implant examinations. It emits only a minimal level of radiation while giving a clear, high-resolution image with which the dental implant dentist asses. Special X-ray equipment takes multiple images which are rendered together to create a full 3D image. The scanning is non-invasive and takes only a few minutes. CT Scans take all of the inaccuracies and guess work out of dental implant surgery. The information and 3D images produced by the scan allow us to confidentially assess your bone architecture, the volume and density of the jawbone, and the location of the nerves and sinus cavities. The quality and quantity of the bone will help to determine the type of dental implant treatment, and the imaging will help us to identify all of the possibilities for implant positioning and alignment. What Can A Dental Implant CT Scan Help To Determine? Diagnosis of bone architecture, density, and volume. Helps decide type of implant. Helps foresee any complications or restrictions. Helps map exact placement, positioning, and alignment of implants. Virtual placement of dental implants using software gives accurate simulation of surgery. CT Scans help us to create the perfect implants to match your mouth. 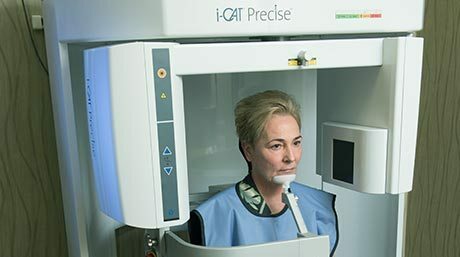 How To Get A Free Dental Implant CT Scan? At Friedman Dental Group we offer a free CT Scan before dental implant surgery, as part of our complimentary dental implant consultation and dental examination. Contact us today to find out more, or to arrange a free dental implant dentist consultation.